the DEC enlarged the Laurel House parking area and the Scutt parking area to 75 cars for each lot. This gave us a total of 150 cars. We had told them that they needed 300 spaces. Sadly, our estimate turned out correct. This is the Laurel House PA in the morning in July. The cars are parked on the side of the road up to the main road. Wow! Where is this in relation to the Scutt rd. (ENd of Escarpment trail)? I am going to be doing a hike of Escarpment maybe next week and dunno if I"ll be able to if there's tons of dayhikers there! 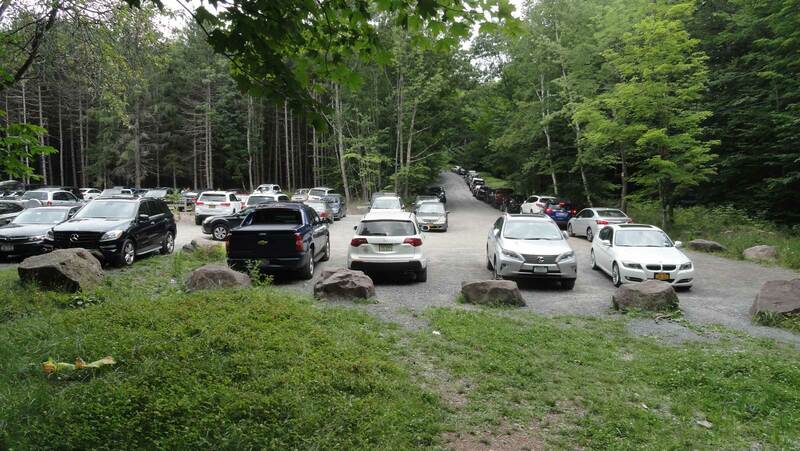 If you are hiking the Escarpment Trail, you can park at the Laurel House PA or the Scutt PA. If you get there in the early morning (before 10am) or later in the afternoon (after 4pm), you shouldn't have a problem. The Scutt PA often has places to park in the middle of the day. You can use either PA, but most people prefer the Laurel House PA. I would not cancel your trip because of parking there. You can also wait for a few minutes for someone to leave. Most of the people at the Laurel House PA are just visiting the top of the fall. So, they only say about a 1/2 hour. Remember that some of the water sources are starting to dry up. So pay attention to water needs.